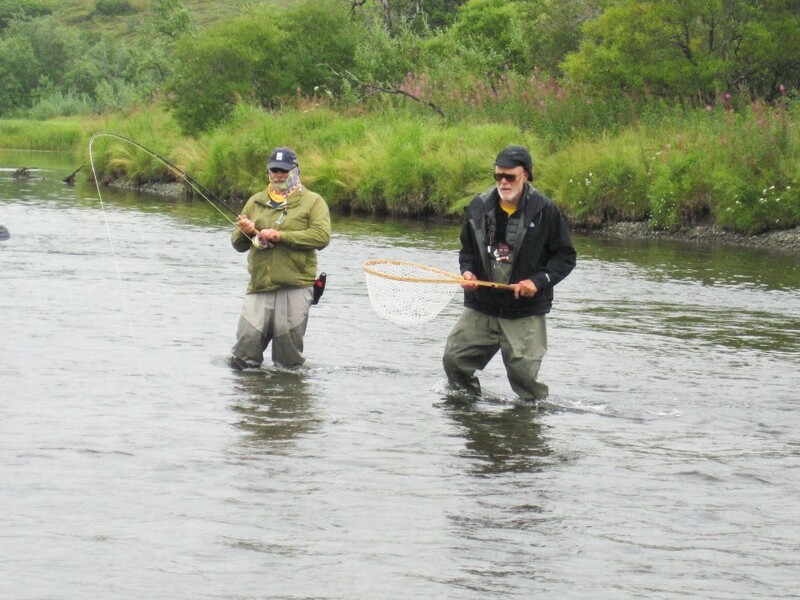 Spectacular fly-fishing with a returning group of anglers. 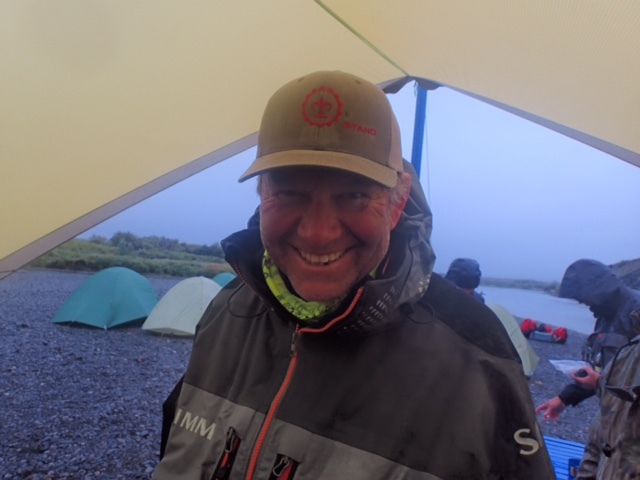 The credit for organizing the trip goes jointly to Scott Slappey and Gary Smith who put together the July 2014th trip and who were eager to compare it with the August fishery about which they heard so much. 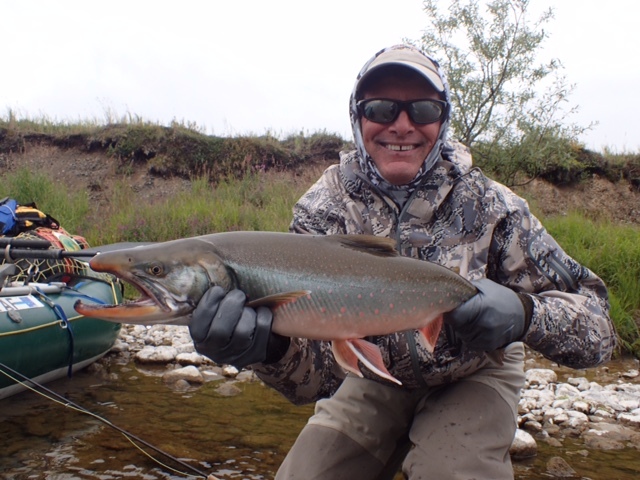 Would the Main Goodnews live up to its reputation as one of the great trophy Dolly Varden Char fisheries of Alaska? Would Coho salmon on a fly be all that they’re hyped up to be? This group was here to find out. Outbound in floatplanes we flew north passing the Wood River range of mountains through Sunshine Pass. Below us was spruce forest and small rivers, dotted with lakes and Beaver ponds. The last real trees we’d see that week passed below and then the country was open tundra and we flew beyond the tree line through the Ahklun Mountain range. The first big river we saw beneath was the Togiak, which has a turquoise color. Rafts were inflated, gear stowed, and we shoved off down the North Fork of the Goodnews, also known as the Main Goodnews. Low water levels made for awkward route finding through the upper river’s shallow gravel bars. We got out and dragged rafts, a recurrent theme in 2015. Still all the crew was inspired to put some miles behind us and get into the fishing. Ted Schmidt and Mark Taylor were great company in my boat as we navigated the shoals. 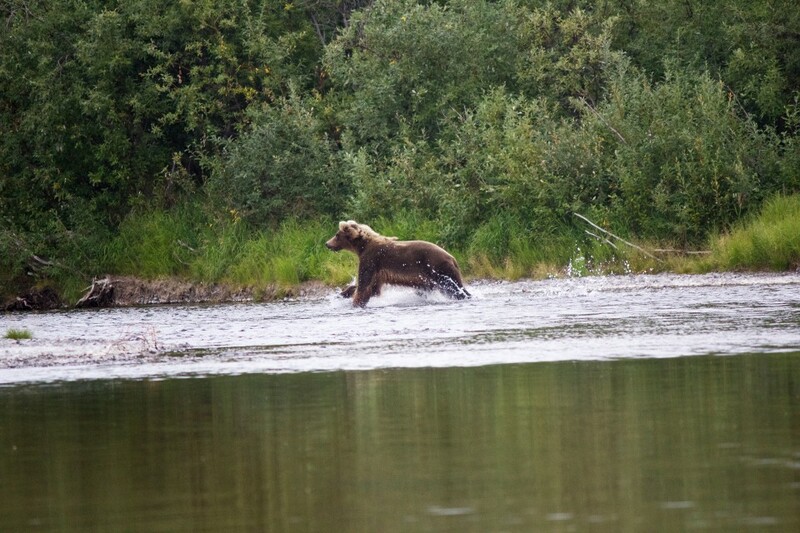 Rounding the final bend above our first camp a young Brown Bear stood up from its day bed along the river. We made camp in the late afternoon. We’d anticipated this trip since we’d shared this camp together a year ago. 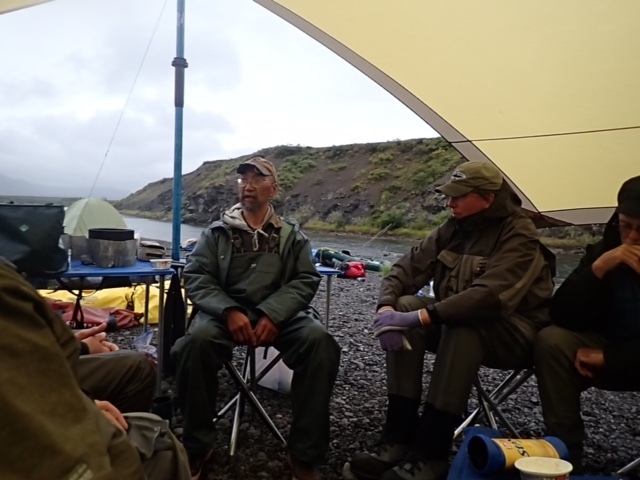 One half of the group was returning anglers and eager to experience the August fishery while Ted and Matt Schmidt, Dan Simon, and Mark Taylor were new anglers joining us for this expedition. What we found in the uppermost river was extreme low water, relatively high water temperatures, and low dissolved oxygen. 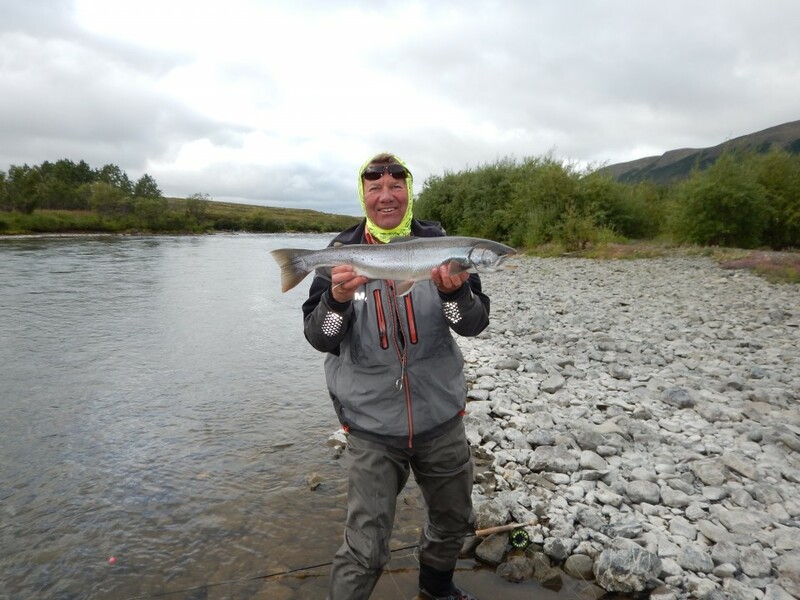 Where 2 weeks prior their had been hundreds of trophy Sea Run Dolly Varden Char (called Char going forward), this week there were only a handful. 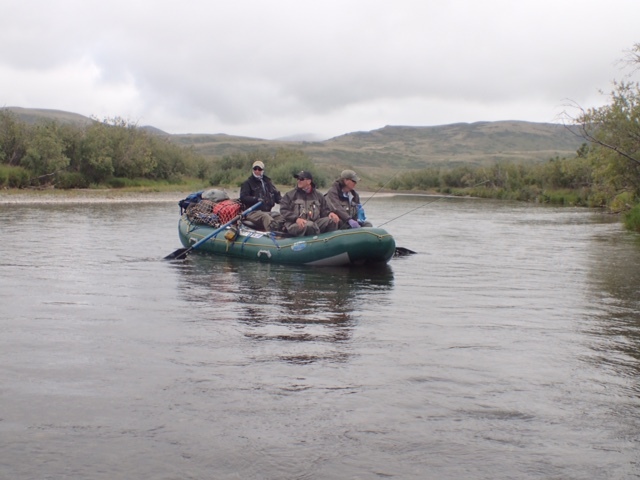 We did what any Alaskan anglers would do, we broke camp early the following morning, then we travelled quickly and directly downriver hoping to intercept fish! Mark Taylor and I climbed up a bluff above a sweeping bend in the river. 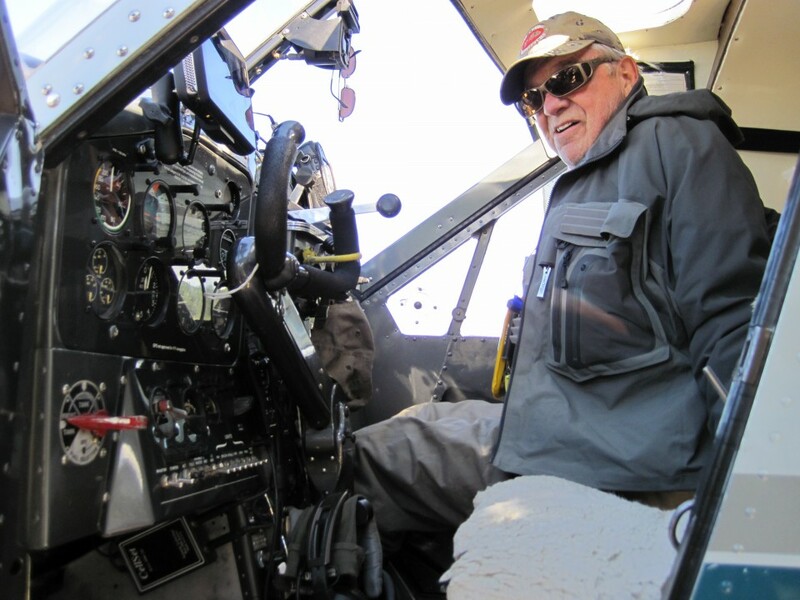 He’d dreamed about taking a trip like this for many years and has devoted his life to fishery conservation with Trout Unlimited. Now arrayed below Mark, Sockeye salmon spawned in pristine conditions and Sea Run Dolly Varden darted about feeding on eggs. The upper river fishery slowly began to materialize, nothing like what awaited us below, yet what was to come was unknowable at this stage of the journey. We fished and travelled, passing growing numbers of fish, searching with egg patterns & leeches. 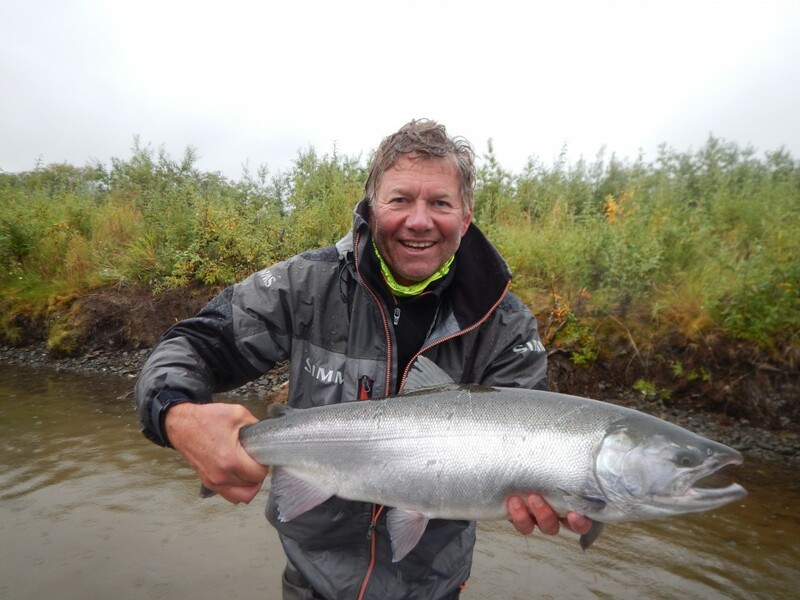 From the log of August 12’Th 2015: “I searched for fish with Dan Simon and Scott Slappey on day two. Dan took a really nice Rainbow in the morning swinging an olive green egg sucking leech among the spawning Sockeye and he and Scott both took some Char but – it wasn’t happening- and we needed to keep moving to find fish”. I was uncertain what to expect. I’ve fished the Goodnews in low water on many occasions over the years but rarely seen the upper river so devoid of fish. Laughter from the rafts downstream told the story. They’d found the uppermost Char. First several dozen, then proceeding down, several hundred, and before the hour was out, the gang was throwing flies at aggregations of up to one thousand Char. In general the fish were arrayed across shallow flats maintaining an even spacing between individual fish. All the anglers hooked up which hardly begins to express the pandemonium. 8 fly rods simultaneously bowed, nets reaching, Char being released, Char throwing the fly, graphite breaking, guys trying to remember how many fish they’d hooked. To experience that kind of abundance as an angler is so rare. It might happen in the saltwater when Bluefish or Striped Bass are feeding in a blitz, or Yellowfin Tuna. Now it was utter chaos. A frenzy of fish and anglers. Minutes became hours. Our pace downstream was halted. Then word was passed among anglers that an exceptional fish was being released and we looked up to see it. 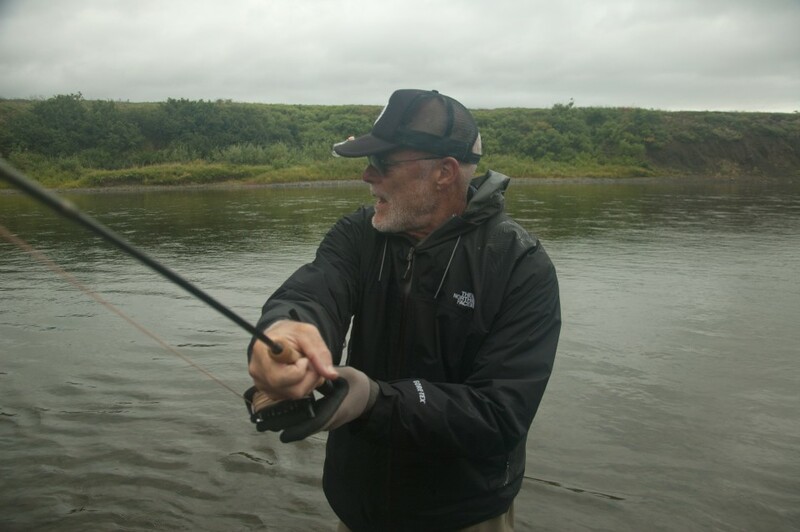 It was Ted Schmidt who released the first Char over 24 inches. 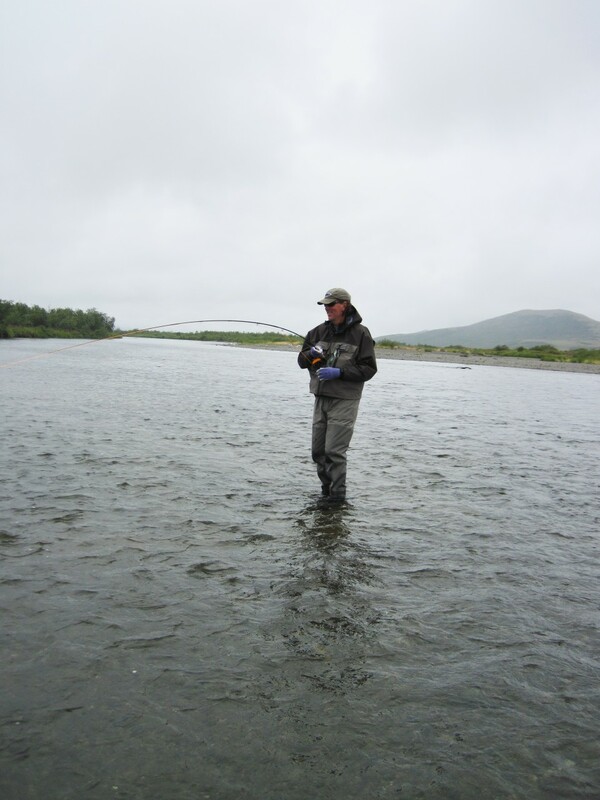 This was the beginning of the strongest week of fly-fishing imaginable! 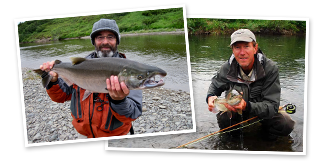 What we experienced was as fine a day of Dolly Varden Char fishing or any type of trout fishing as we’ve ever had, or even heard of. We switched flies and techniques. 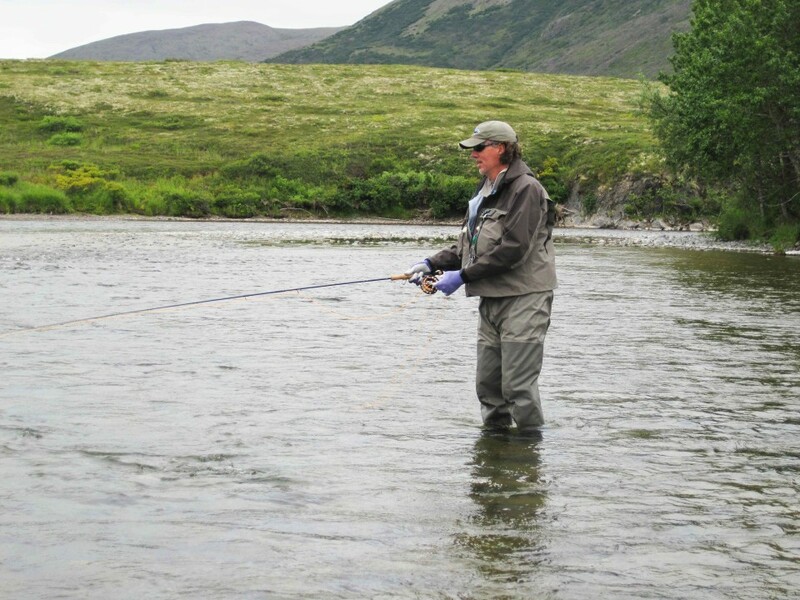 Those who exclusively fished streamers took fewer fish but they took the largest trophies. The trout bead was undeniably, the “money” fly and took huge numbers, several hundreds of fish were released on the bead. And then we switched it up again, tying on dry flies. From the log of day 2: “each cast rising 5-10 Char, following with jaws agape, noses up, boils of water.” It was as exciting for the spectators as for the individual fly caster. It was hugely entertaining! 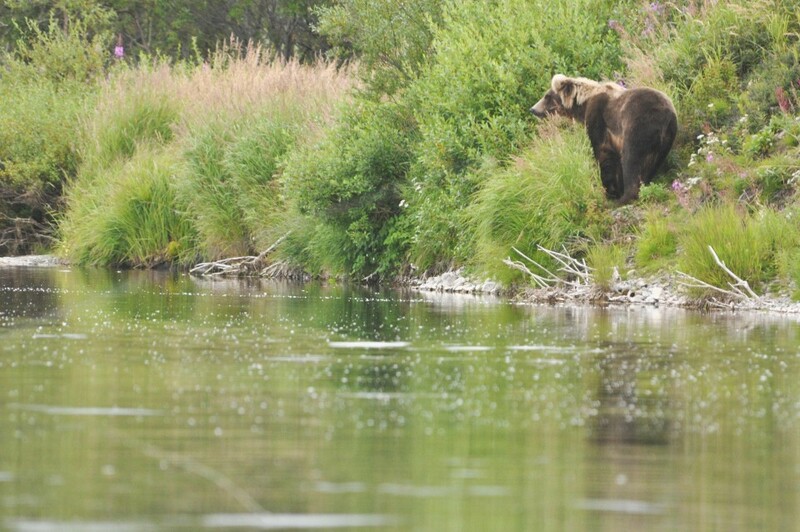 I heard many times that day: “That was the best hour of trout fishing in my life”! The log noted that although there were “some pods of Sockeyes still staged in pools awaiting final sexual maturity more than ½ the salmon were now spawning”. It was in fact the peak of the salmon spawn. 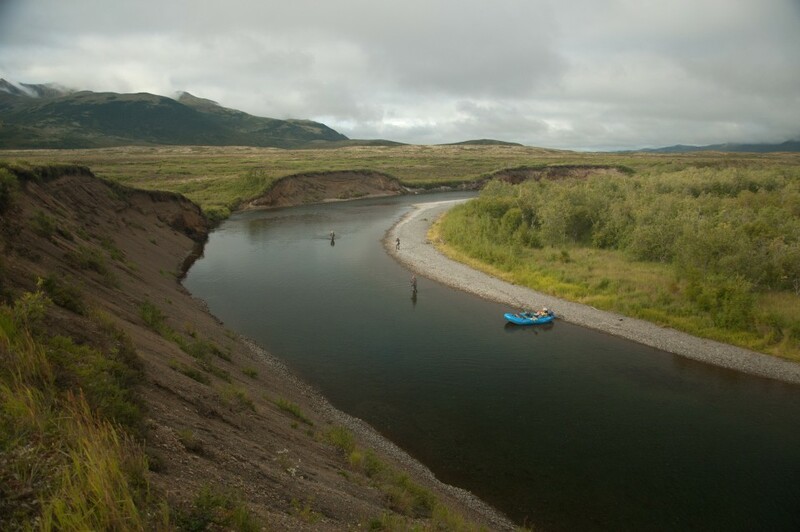 A lone Bull Caribou walked down the river keeping just ahead of the rafts. 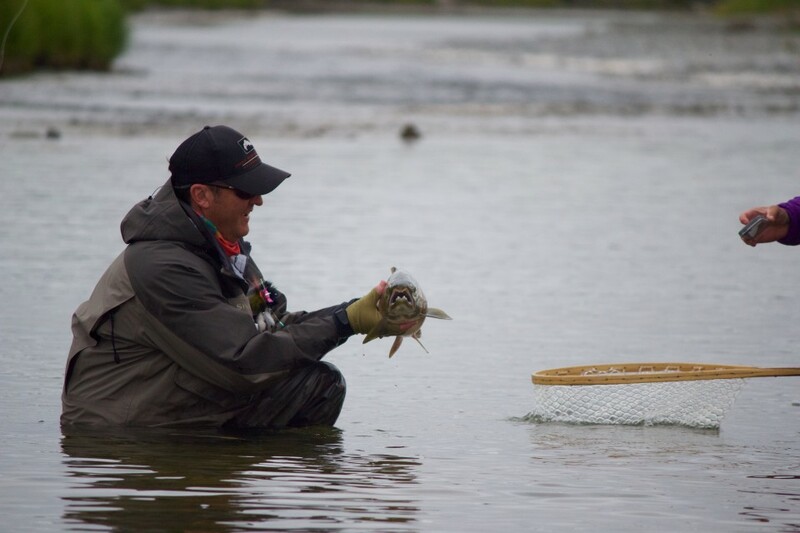 We took a break from the casting and our obsession surrounding the Dolly Varden fishery. We picked up binoculars and cameras and in doing so returned to the great drama that unfolds before us when we travel across the tundra landscape. 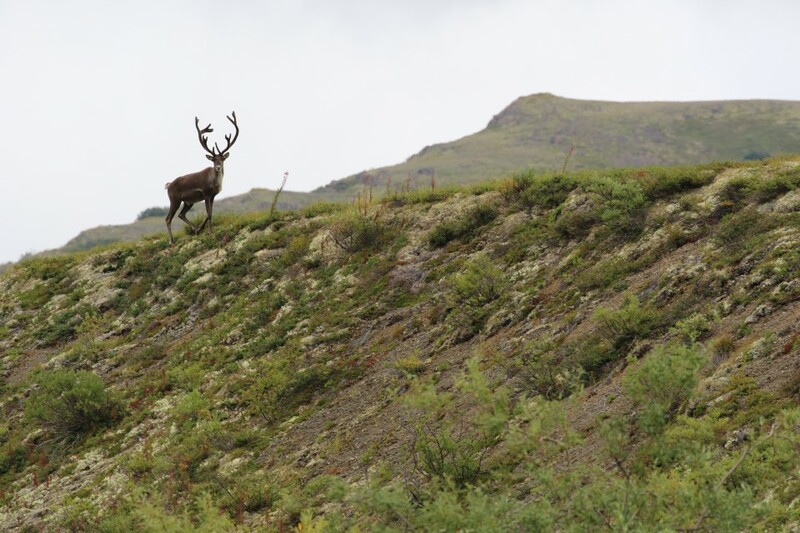 To our right ran the Caribou bull gaining high ground and then was skylined against the ridge where we could all view it. We dined on very fresh Char. Today 3 Char were killed in the 20” class that had just migrated upstream from the sea. For a party of a dozen anglers, 3 fish of this size, yielded 6 fillets, which was plenty. We augmented the fish with a large salad, red beans & rice, and wrapped it in tortillas. The evening was spent repairing two damaged fly rods and re-living what was a spectacular day. Mark Taylor called the day: “Char madness”! Some of us had experiences this day that veered off into uncharted territory. Ted might have been one angler that was transported beyond “the realm”. 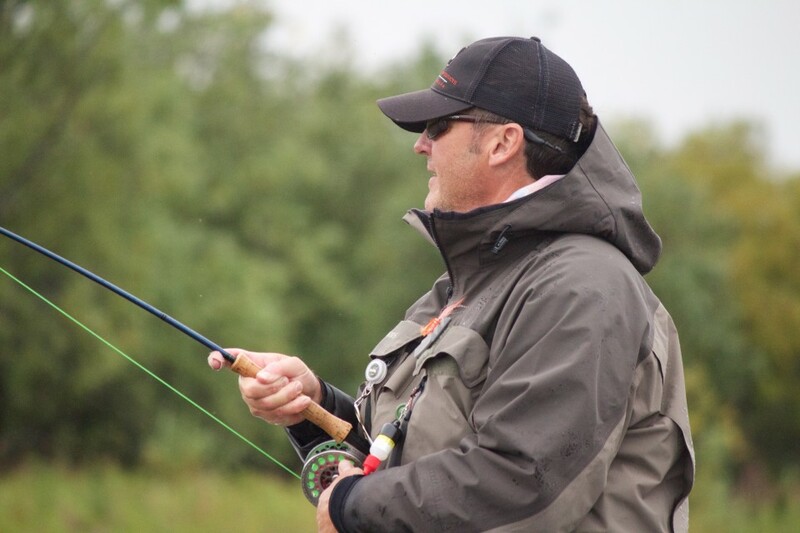 Ted put in long hours on the fly rod and connected with more big-shouldered Char than an angler might see in a lifetime. I fished with John Micheaels and Matt Schmidt in the morning taking several dozen nice Char. Both men are intense anglers. The dry flies again provided lots of action with Sea Run Dolly Varden. By midday we’d passed below the peak of the Char run although I almost hate to draw attention to that because it wasn’t clear until we looked at the field notes in hindsight. If the “in river distribution” of the Char were plotted on a graph one would see a distinct bell curve with the peak of the bell on August 12. Likewise- and this is far from always the case, the bell curve with the peak of “Char of abundance” fell on the 12’th. In plain terms the majority of the run was compressed spatially in just 10 miles of river. For the record we’d also see fewer Arctic Grayling lower down because they were similarly distributed in the sweet, cool headwaters. The fishery changed and the guys changed tactics. 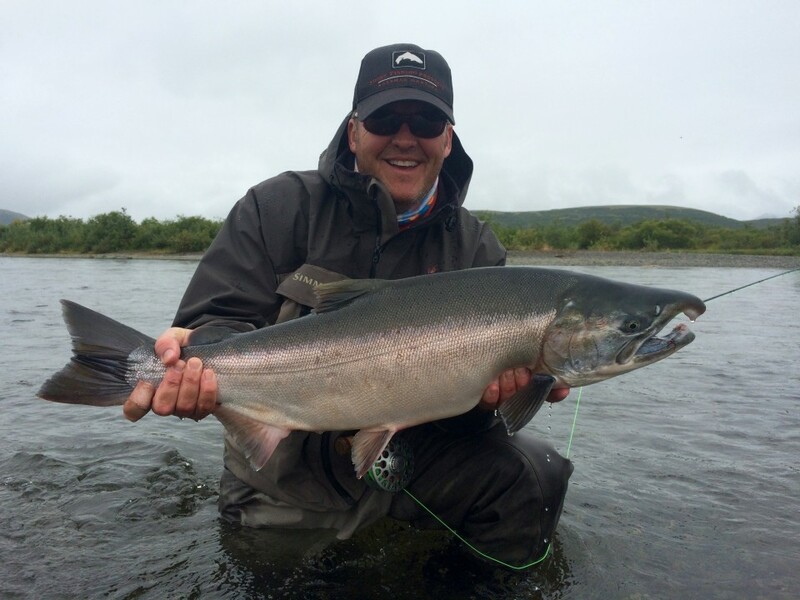 From the Log: “Matt switched from his light rod to his streamer rod and hooked his first Coho along a bluff. 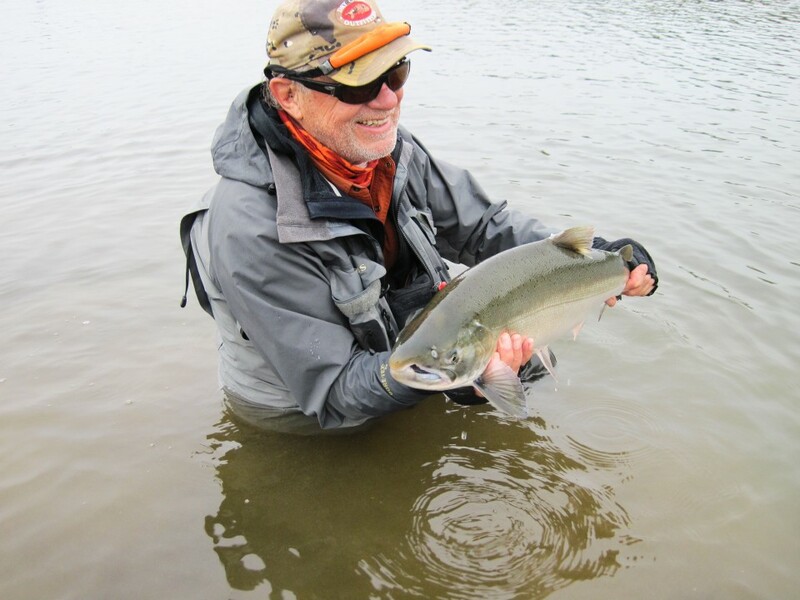 It was a spectacular, silver salmon raging around the river, busting his knuckles, the drag screeching- like an alley cat, and the fish leaping.” The anglers who took Coho that day wondered after the experience “How will it go tomorrow? Will my (remaining) streamer rod take the strain? Will my rotator cuff be up to it? We passed downriver on the 4’Th morning under a marine layer, which is a weather forecasters euphemism for fog, mainly suited to biting insects. The bugs were bad! We were thankful for any little breeze. As I watched Mark Taylor and Dan Simon casting in front of a Beaver lodge a Mink scampered out of the water and was mobbed by sparrows objecting to it’s presence. Dan Simon, whom I was getting to know, was a gem! 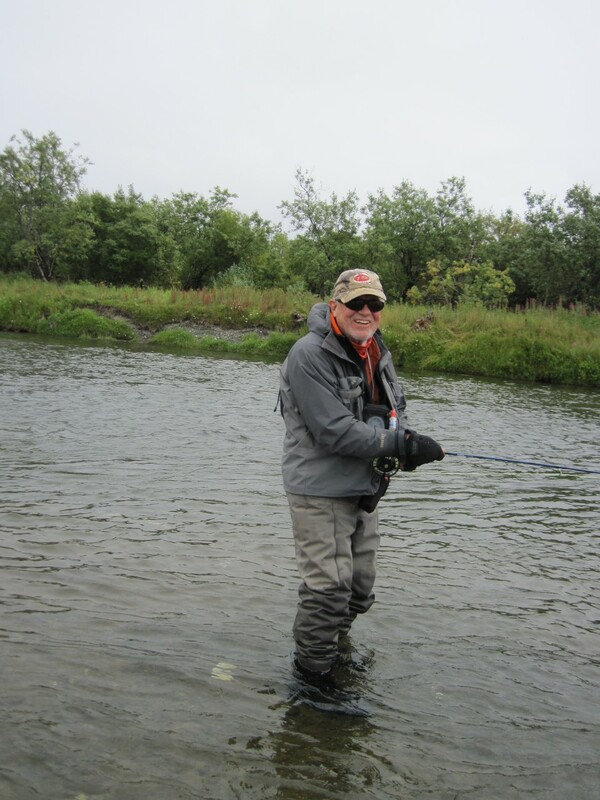 He had come from a trout fly fishing background and quickly found his footing with the big Dolly Varden. He casted long hours, occasionally rubbing his shoulder and lower back, never complaining, just quietly taking it all in. A cold “parcel of air” settled in about 11:00 am and at noon John Trachta forecast rain-, which lasted all afternoon, and through the following night. John Trachta, as an angler might take you by surprise. One moment you are sharing a raft considering where to cast so as not to occupy his fly-line’s “airspace” and the next moment he’s discussing the nuances of the control panel of a naval fighter jet, while he casts his line over yours. In these circumstances we passed downriver throwing the heavy streamers into salmon pools, root wads, and woody debris. The rainbow trout John and his crew took were highly pigmented and at any other time of the year would be the most noteworthy catch of the day, perhaps the largest wild trout of a lifetime. 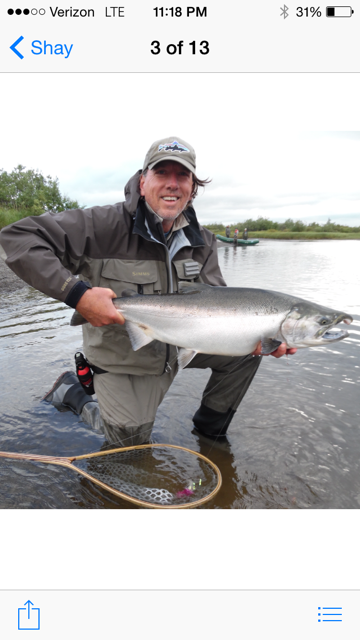 However Mark Taylor’s “Coho Madness” was descending upon us now. 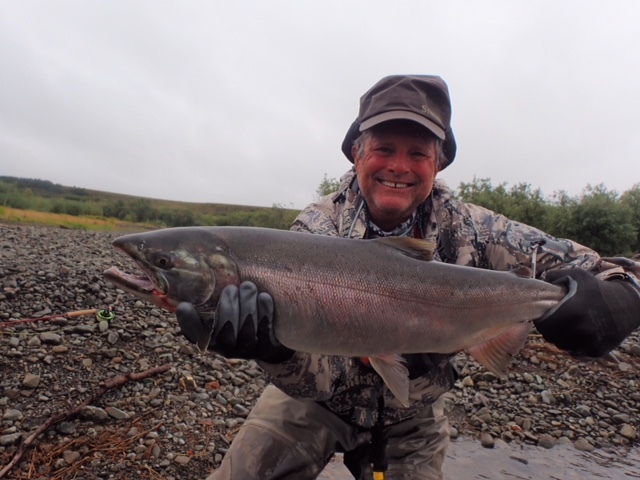 This would be the last day when anglers released in excess of 20 Char per person. We passed on down the river- casting. At day’s end we had a nice hour-long visit with two “River-Keepers” employed by Goodnews Village. They patrol the river daily during the busy sportfishing season and we passed the time with Paul and John drinking hot cocoa and listening to their stories. Ted very graciously shared his cigars. The evening closed out with 9 Coho hooked below camp and 6 to the net. Well done! Now the focus of the trip shifted toward Coho from Char, Grayling and trout .We still hadn’t descended into the peak of the Coho bell curve, nor had we completely left the trout and char behind. 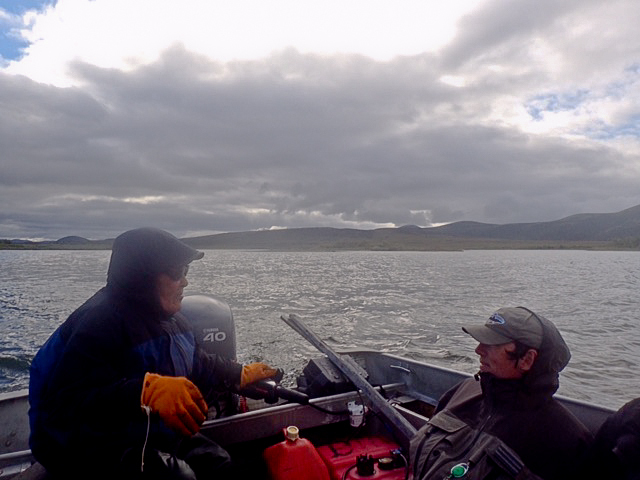 We were in between and neither the fishing, nor the weather was easy. 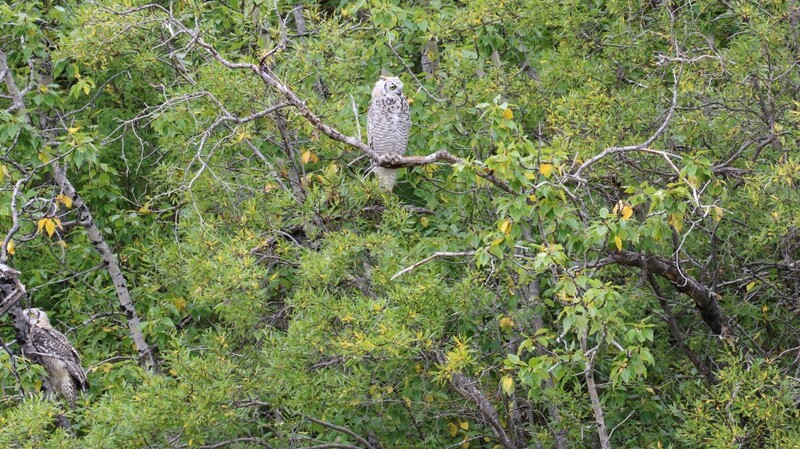 August 15 was steady, rain, wind, only tapering to a drizzle before another squall of rain hit. All the anglers worked hard. I watched Scott Slappey and Ted cast for hours taking the occasional trout and char and Grayling but it was a tough day. The Willow covered hillsides were starting to turn golden. The Sandhill Cranes and White Fronted Geese were enjoyable to watch. Another Mink was spotted going about his deadly business. From the log of August 15, 2015. The mountains across from camp were shrouded in a mantle of mist and wind driven fog. A Red Throated loon flew past croaking. With the constant rain the insects left us alone. The guys built a nice fire to relax by and tell stories and compare fly fishing tactics. Another part of our evenings was spent assessing the damage to our quiver of fly rods. Guide John’s repair shop was open most nights where he maintained a dwindling number of rods while discussing the nuances of rod warrantees for the less fortunate. 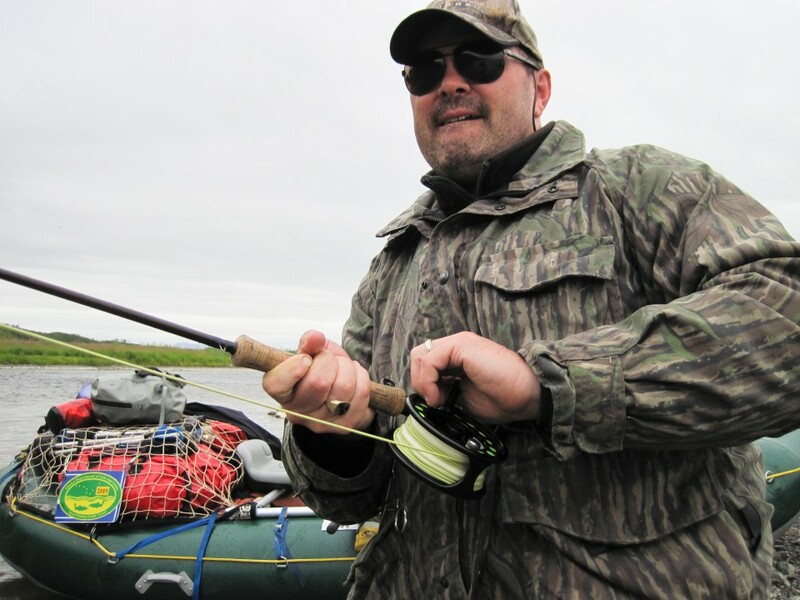 By trip’s end 7 rods among 8 anglers were damaged beyond usability. Char and coho madness indeed! A final note in the log. 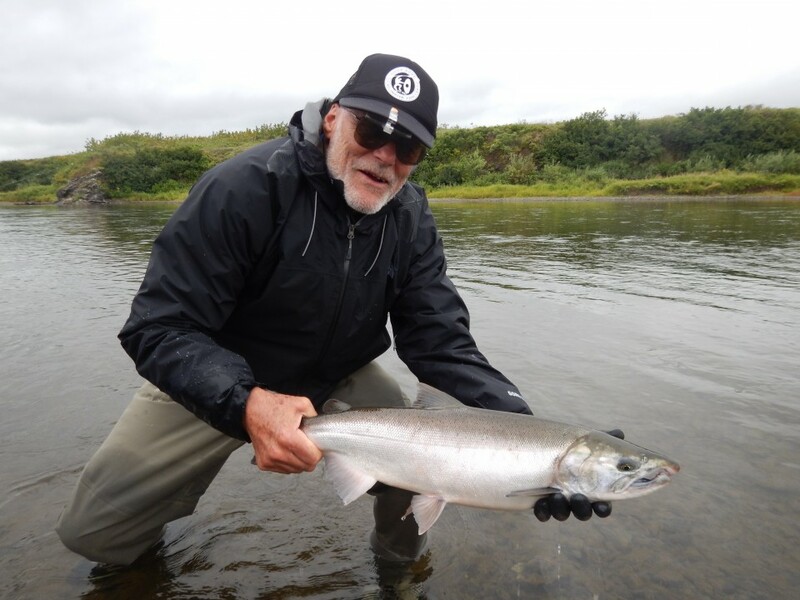 A tip of the hat to Dan Simon today who released almost as many Coho as all the rest of the anglers took combined. On August 16 the crew of anglers found the first of many “Silver Salmon jackpots.” The game changed again and the anglers tactics as well. 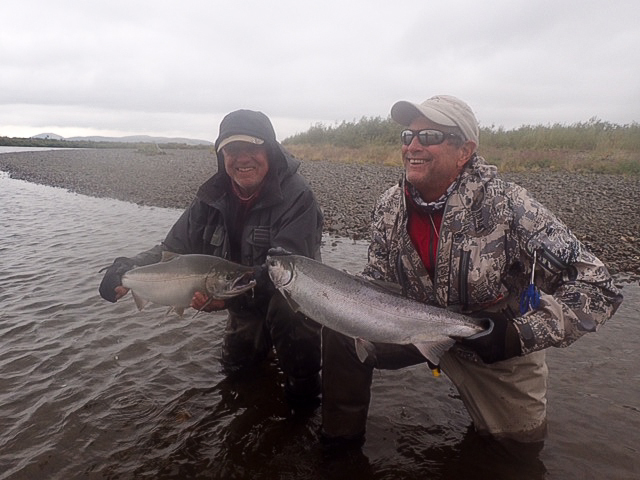 Below an island I call Jim Bean’s island the group took 15 Silvers on streamers in a handful of minutes. 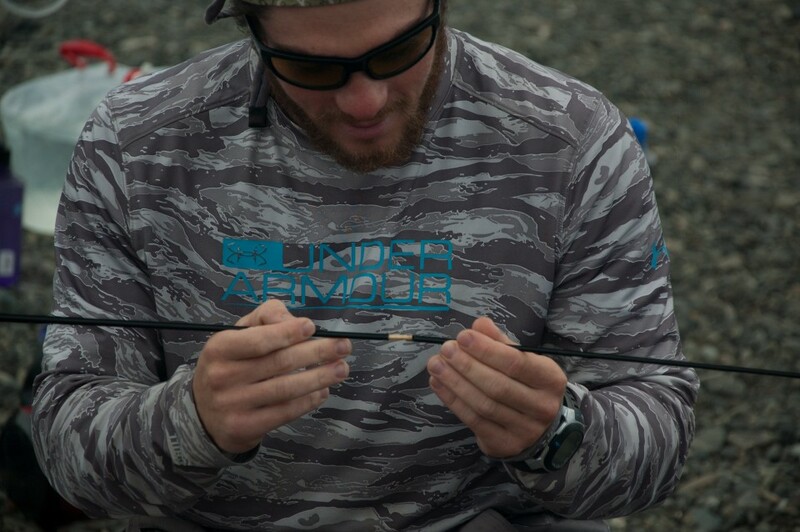 The tactical change came from understanding how Coho “stack up” when there are large numbers in a small pool, then what the fish do in response to the first handful being hooked, and finally where to cast for the next fish. 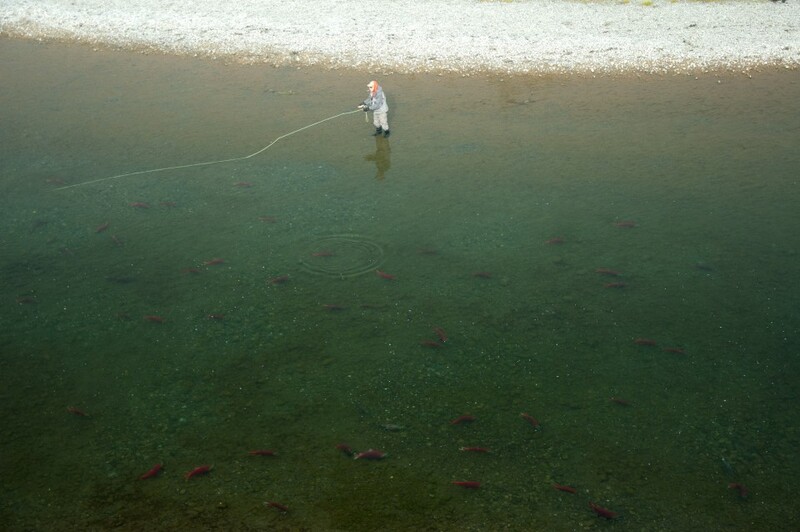 Coho nearly always respond to angling pressure by moving downstream, almost never upstream. So after the first fish were taken, progressively the casting targeted lower in the triangle of water at the end of the slough or eddy. We call it the “golden Triangle”, and the triangle is the last “easy” water before the current sweeps along the bank unimpeded. After the last fish was taken from the triangle there were a couple more along the deep bank and then it was head downriver to the next holding water. From the log: “Great slabs of chrome. Hundreds of Coho. 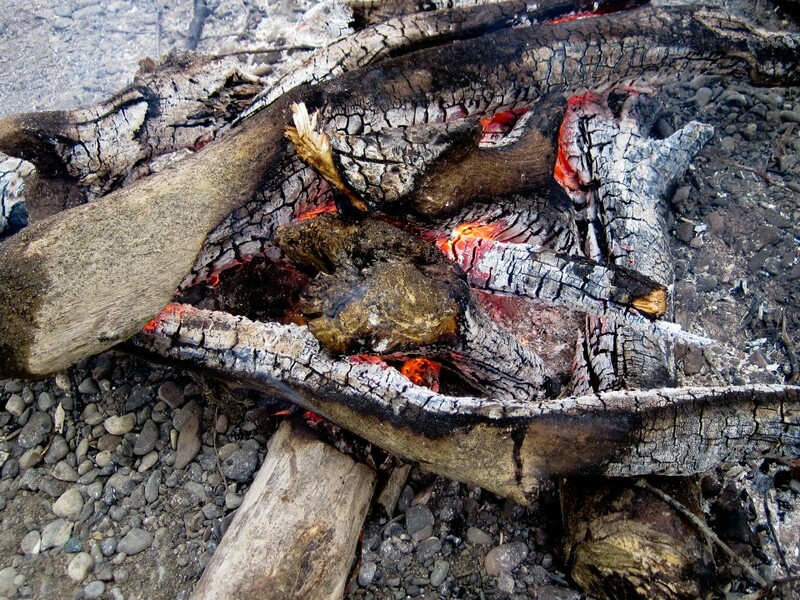 Graphite rods splintered.” When we’d had all we could take we rowed downriver to camp. It was a day that was way over the top of all our expectations. Then amid high drama at the close of business Matt took a fine 10# Coho for the evening meal of Sushi rolls. That mention hardly does his catch justice but you had to have been there to see him in action. It happened when the cook called out the emergency public service bulletin that a fish was needed for supper because the first was not up to Sushi quality standards. 8 Rods went to the river. Matt produced! From the log of August 17: “Coastal mist and fog. Geese feeding in the uplands on berries. The Coho fishing was completely insane. Over the course of the day anglers fished to the point of exhaustion. More than 104 Coho released today. No one had enough energy to fish after dinner.” It was an amazing way to close the trip out. 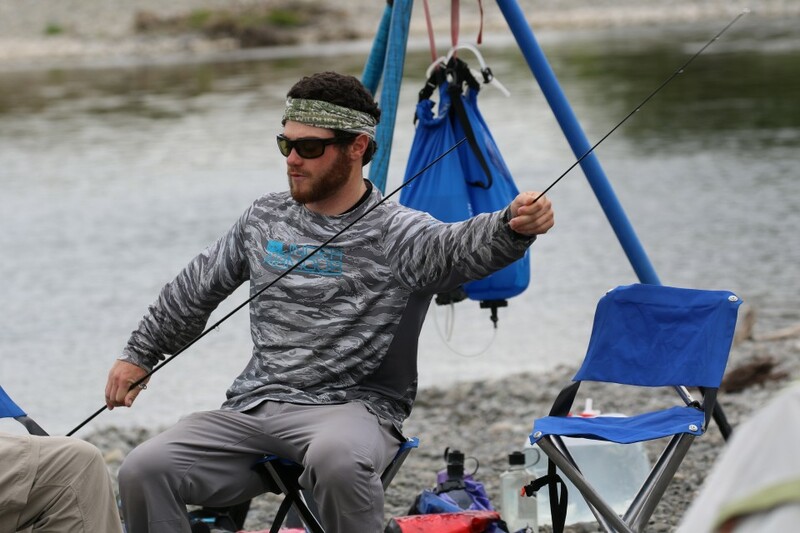 We’d rafted and fished for nearly 70 miles and seen a wild Alaskan fishery at it’s best. Tomorrow we’d float out the last miles and begin the journey home. The first leg home was to the Yupik Eskimo village of Goodnews Bay with our boatman Bavilla Merritt and then by small aircraft back to Dillingham and finally the gang headed to points south. Great memories!